Prepare yourself for the most brutal of all row variations: the Kroc Row. First implemented by Matt Kroczaleski for upper back development that explodes the latissimus dorsi, the Kroc row is a variation of the common dumbbell row. There is no reason to keep doing controlled, low weight, low rep dumbbell rows when you could be doing Kroc rows instead with the heaviest dumbbells you can lift. Matt Kroczaleski began performing his own variation of the dumbbell row when he stopped doing dumbbell rows and noticed his bench press and deadlift lockout and grip suffered. So he plugged dumbbell rows back into his routine. 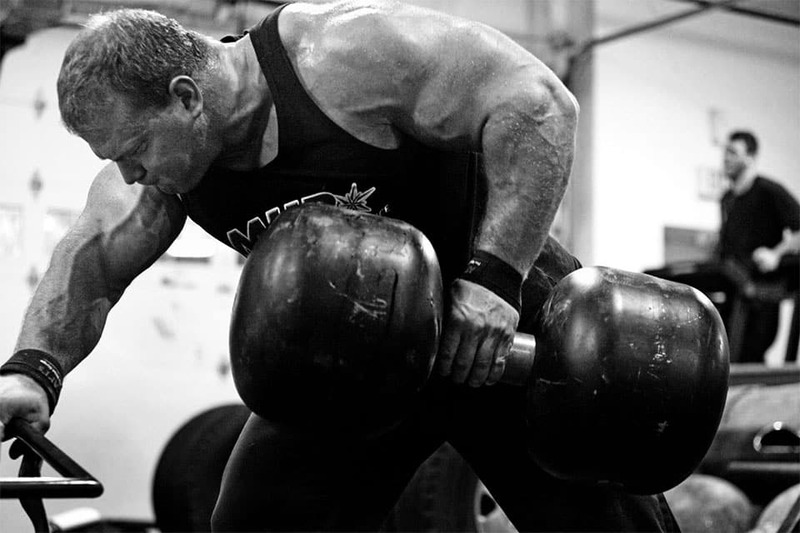 Because his gym’s heaviest dumbbells were only 150 lbs, he began doing 20-30 reps in each set. When he built his own home gym, he welded his own damn dumbbell handles that were essentially just shorter barbells which could stack over 300 lbs. His personal record is 13 reps at 310 lbs. Kroc rows are a heavy, bent-over, dumbbell row that utilizes the lifting of heavy dumbbells with a lot of repetitions. In comparison to a regular dumbbell row, they are less technical in that you can add more body english into the lift to pull more weight. Kroc rows are usually a set of 20 repetitions on each arm. On the way down, the shoulder should drop lower than usual in order to stretch out the back muscles. On the way up, focus on contracting the shoulder blades and pull with your back rather than your arm. Typically, the dumbbell should be pulled to the bottom of the rib cage, touch the rips and then lowered again. There is no outward “arm arc” on the way up and there certainly is no pause at the top like a normal, slow dumbbell row. Pull that dumbbell like you’re trying to start up a chainsaw or lawnmower. 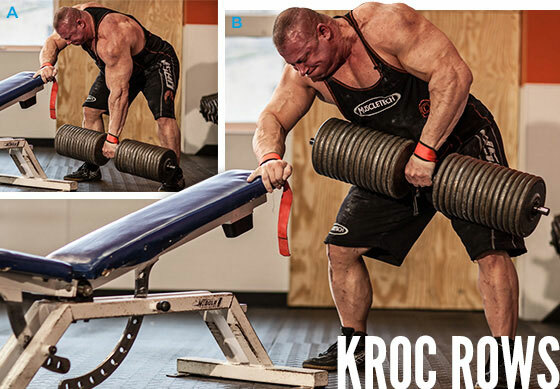 Like I described, Kroc rows are lifted with brute strength and body english. Pick up the heaviest dumbbell that you can do normal dumbbell rows with for one single set of 8 repetitions. Now do 12 repetitions instead of 8. When you reach 12, turn on the mental beastmode switch and pump out 8 more or go to failure as close to 20 repetitions as you can. One set per arm. You should be absolutely exhausted after two sets with each arm. Matt recommends doing two warmup sets with each arm followed by one working set to failure with each arm. Like Matt, I like to stand and use my free arm to lean on a bench rather than put my knee and arm down. The extra room provided by standing and leaning allows your shoulder to create a greater range of motion. Your body should be at a 15 degree angle to the ground. Straps are acceptable if your focus is entirely on lifting as much weight as you can to work your lats, but if you opt for just some chalk to help your fingers from slipping, Kroc rows make an excellent grip training exercise. Once you reach 25 reps with your dumbbells, increase the weight next time you do Kroc rows. Even if you have to increase from 120 to 130 lbs because your available dumbbells only go up in increments of 10 lbs, there’s no shame in being able to row 120 lbs 25 times and then 130 lbs 20 times. Just work back up to 25 repetitions and move up to a heavier weight. Your lats and biceps will love you for your mental ability to do Kroc rows.